Don't let it go to waste. Although they're useful for storage, there are much better uses for your garage. Garages are often treated like a giant storage box -- for cars, junk or boxes. However, using a garage like that means you're missing out on the living space it can add to your home. Do you need a garage remodel or renovation? Garages come in all shapes and sizes-they can be an attached garage, attached with double doors, detached garage, or have a breezeway. Perhaps you already have a garage but would like to renovate. If that sounds like you, the garage remodeing experts at Starcom Design/Build are here to help. We can provide new installs, renovations, and conversions to help you get the most out of your space. Call us today to learn more about garage conversions in Silver Spring, Columbia, Rockville and nearby. We offer free estimates on all our work. Garage Renovation: Add to the usefulness of your garage space with a simple renovation. Restore the beat-up and worn area into a clean state. 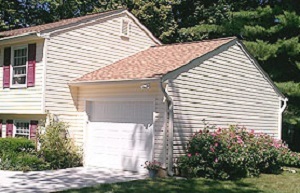 From repainting the concrete to installing shelves, we can give you back the utility of a new garage. Garage Remodeing: A garage remodel is a great way to reorganize your room into something that gives you everything you need. Set up a tool and construction area, a pit to work on your favorite car, or even an indoor play area for the kids. Garage Conversions: Another great way to add significant value to your home and make more out of your neglected garage is through a repurpose. It is a type of garage remodel where you shift the purpose of the room into something you can better enjoy: consider an entertainment or rec room, complete with heating and air conditioning, TV, couches, pool tables, etc. Are you ready to build a new garage? If a garage addition or garage conversion sounds like the right fit for your home, Starcom Design/Build is ready to help! We will work with you to design a space that fits your needs and gives you the updated room you need. Call us today at 1-855-230-3690 to get a free estimate on garage renovations and all our home addition services. We proudly serve in Silver Spring, Columbia, Rockville, Glen Burnie, Annapolis, Laurel, Ellicott City, Gaithersburg, Catonsville, Parkville and throughout the surrounding areas.